For ferret lovers only! Gosh, this lovely plush ferret is so realistic looking, every time I look at it. I love how it reminds me of my old ferrets from the past who passed over the Rainbow Bridge. The plush is made with high quality and realistic looking. Plush such as these are great for adults, maybe not so GREAT for a child at this price point. I put my ferret plushes in a curio cabinet to display. It keeps shows them off all at the same time, as I have quite a few, and the cabinet also keeps them spotless and it great condition. I am grateful that Hansa has taken the time to create these beautiful plushes for us ferret lovers!. 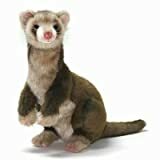 Plush Ferret 12″ By Hansa is a wonderful realistic looking ferret, the surface is washable. Very cute one to add to collection. This entry was posted in Ferret Plushes, Ferret Tubes and Toys, Uncategorized and tagged 4556, Hansa, Plush Ferret 12" By Hansa on December 4, 2014 by admin.